White King II is all about majestic beasts and guess what colour they are – pure white. The game is played over a standard five by three grid. There is a total of 40 win lines available and this number can be adjusted as the player sees fit. The standout feature on White King II is certainly its double symbols. These can make for some enormous winning combinations. Then there’s the Free Spin mode with instant cash prizes. The maximum number awarded is 50 too! Nice theme and artwork. 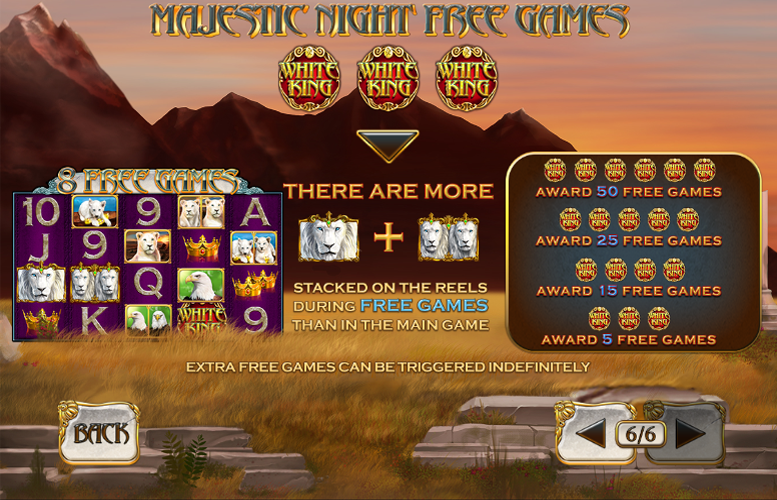 White King II looks great, even for a slightly older slot machine. Massive main game prizes. Hitting a top jackpot on White King II could well be lifechanging! Huge Free Games mode. It’s hard to imagine coming out of 50 free spins without anything to show for it. Features lack diversity. Yeah, they’re very lucrative but with so many powerful beasts around, the omission of a true second screen bonus feels like a missed opportunity. Lousy return-to-player rating. At just over 92%, this is not the game to be wagering through a bonus on! Normally, we’d be talking about five or six-of-a-kind winning combinations in this section. That’s not the case on White King II, however. Thanks to the double symbol dynamic discussed below, the maximum number of matching symbols a player can hit is 10! Lion “Wild” = 5,000x the line bet. Crown = 2,500x the line bet. Lioness, Eagle, or Cub = 1,500x the line bet. 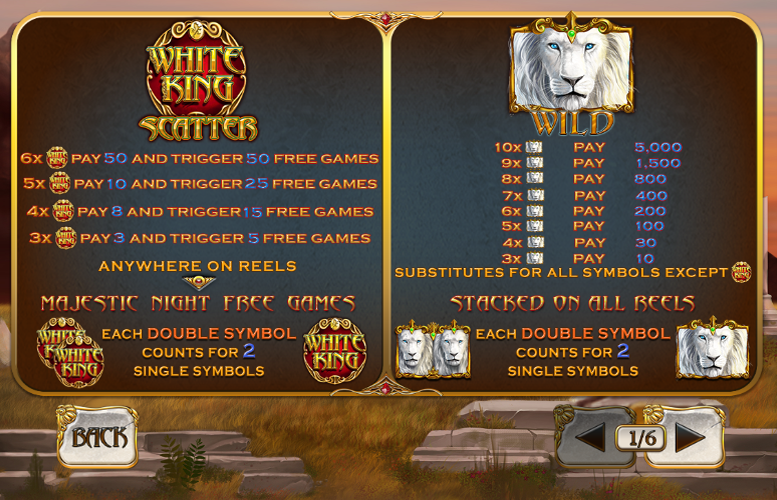 On the White King II slot machine, symbols can appear in doubles. This means it’s possible to create massive 10-of-a-kind wins. 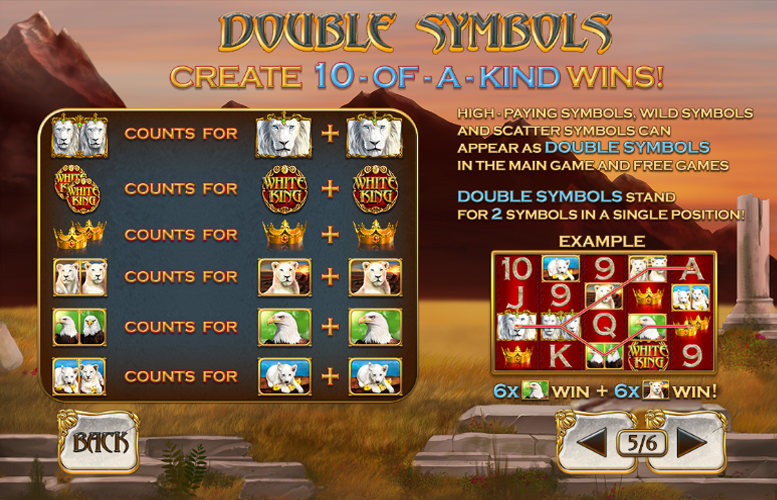 The high-paying symbols, “wild” symbols, and “scatter” symbols can all appear in double in both the main game and free games. These double symbols occupy a single position and could as two symbols. Six “Scatters” = 50x the line bet, and 50 Free Games. Five “Scatters” = 10x the line bet, and 25 Free Games. Four “Scatters” = 8x the line bet, and 15 Free Games. Three “Scatters” = 3x the line bet, and 5 Free Games. 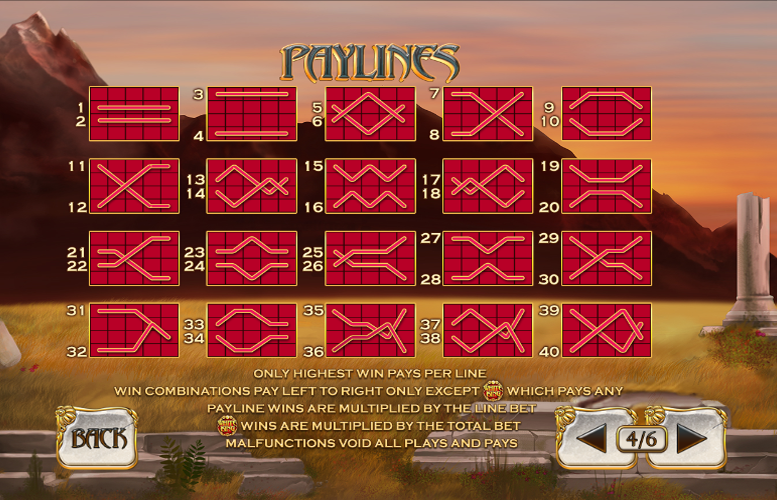 Players should note that there are additional “Wild” and Double “Wild” symbols added to the reels during the Free Games. Also, extra rounds of Free Games can be triggered indefinitely. In addition to the White King II’s higher value animal symbols, there are also some that do not pay quite as handsomely. As is common on online video slots these days, the lower value symbols have been taken from the upper end of a standard deck of playing cards (A, K, Q, J, 10, 9). Ace or King = 500x the line bet. Queen or Jack = 160x the line bet. Nine of Ten = 120x the line bet. Players are given a large degree of control over how they want to distribute their bets on White King II. They can adjust both the number of win lines and the amount bet on each one. Any number of win lines can be selected between one and 40. Meanwhile the minimum and maximum bet amounts are 1p and £10 respectively. This means, when all values are set to their minimum, the lowest possible bet per spin is just 1p. Conversely, the largest possible bet per spin on White King II is an impressive £400. Whilst this isn’t the largest upper betting limit we’ve seen on a Playtech title, it will surely be enough to satisfy those with the most ample bankrolls. White King II is one of those slots that you will either love or hate. Those that hate it will likely complain that the game is too prize heavy at the expense of features. Meanwhile, those that love it will appreciate it for exactly the same reasons. The game’s only real bonus feature is the Free Spin mode. This is potentially massive and automatically dishes out a payment just for triggering it! 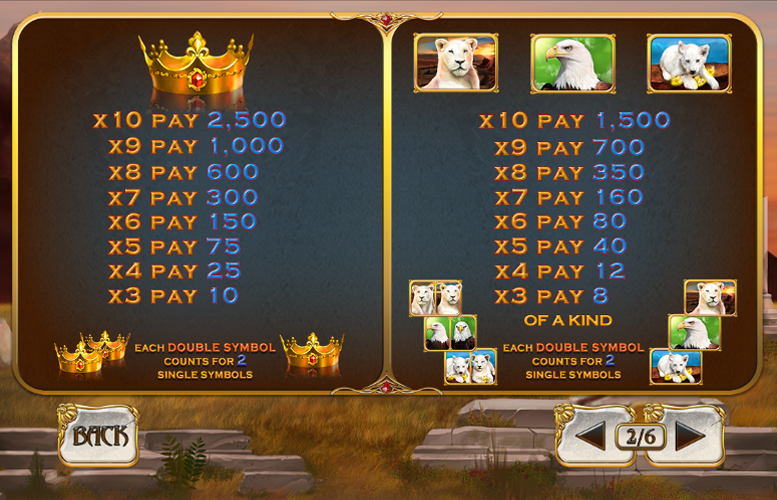 The other standout feature on the slot is the double animal, “wild”, and “scatter” symbols. These can make for some enormous wins, but they don’t add much to the gameplay experience. If you’re looking for a slot machine that is straight forward to play and all about spinning in a massive symbol combination on a single credit, White King II is probably just what the doctor ordered. However, if you prefer your games with a lot of diverse action across multiple screens, you’re far less likely to enjoy it. This game has a rating of 4 / 5 with 781 total reviews by the users.